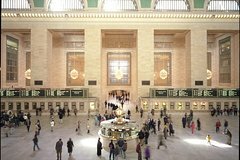 This tour focuses not only on the architectural highlights of Grand Central Terminal but provides a real story about little-known secrets, anecdotes, archival material and the history of this famous train station. Visitors will not see Grand Central with the same eyes after taking the tour. Perfect for travelers, tourists and locals alike! The tour is available in English, French, Spanish, Japanese, Italian, Chinese and German. On this audio tour, get a history of Grand Central Terminal, filled with interesting details and insights. This tour includes a state-of-the-art audio device and headset and a map of the terminal. Discover the architectural highlights, hear anecdotes and explore archival material as you wander around the iconic terminal at your leisure. If you want more in-depth information, there are options for additional material at the push of a button. The self-guided tour can last as little as 30 minutes to just over an hour. The tour is available in English, French, Spanish, Japanese, Italian, and German.